Ten Ton Hammer | Paragon: Card Crafting Arrives Tomorrow! Paragon: Card Crafting Arrives Tomorrow! Epic have released a new blog post detailing update 35.1 and the impending arrival of card crafting. Unlike many Paragon players I have almost every card in Paragon - I'm only missing 5. Despite that, there was one card that eluded me for nearly 6 months (Tainted Magic) and at the time, it was one of the most important cards in the game, especially for Iggy & Scorch. I spent millions in Reptuation trying to obtain it and only recently managed to get my hands on it. Card crafting is supposed to address such misery and bring a much more level playing field to anyone only just arriving into the game. 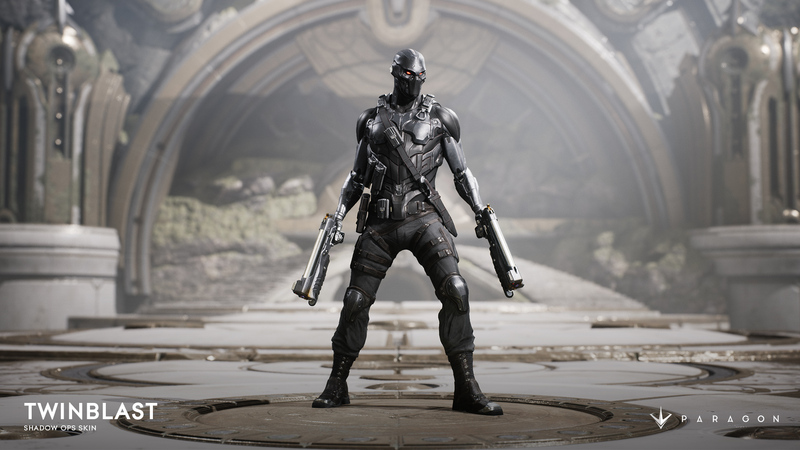 Alongside this long awaited feature, there's a brand new skin for Twinblast that will be available to everyone for free as long as they play 10 matches of CO-OP or PvP. Full notes below. Welcome to the V.35.1 update, dropping on Tuesday, Dec 13. First up, we are giving you two highly requested game features. Card Crafting is the new way to get any card you want in the game. The system is pretty straight forward: dismantle unwanted cards to create crafting parts. Then, use those crafting parts and some Rep to build new cards. Be careful, because once you dismantle a card it is gone for good. Now is the perfect time to craft those cards that have been eluding you and complete the set! The second new feature is Loot Crates. These Loot Crates contain Rare Skins, Master Challenges, Boosts, Coins, and more! Loot Crates are randomly dropped after completing matches and require Keys to open them. You have a chance to get Keys from Tributes, and higher chances from Master Challenge Tributes. You can also purchase both Loot Crates and Keys with in-game Coins. Check out both the new features in the video below. We have noticed a large amount of discussion about the state of Iggy in Monolith, in this update he does receive a number change. Look for more changes to his balance over the next releases, as well. We plan to also continue making changes quickly, based on data and feedback. Last but not least, all of our Winterfest skins will be going on sale. Now is your chance to complete the collection. Sale runs from Dec. 13 to Jan. 9. Read more here. Loot Crates are now available for purchase. Card Crafting has been released. Tier 2 Towers no longer have a 300% damage bonus buff while immune from damage. Super Minions will now spawn after melee minions as they leave base to prevent getting focused down by incoming waves. White Jungle Minions should now have death FX. Green Buff no longer will cancel out of targeting when it expires. Fixed a bug where the colored tower rings remain green for the remainder of the match on rejoin. Fixed a bug where backdoor protection FX could disappear on rejoin. Various fixes to collision, cameras collision, and geometry. Bots should no longer be able to see through Fog Walls. Kwang-bot should no longer throw his Judgement of the Heavens (Q/Square) to center of the map. Fixed bug where enemies and minions could become temporarily immune to damage while a Hero was knocked back. Fix for Heroes occasionally being unable to move after using jump pads. Empowered Right Crunch should now have the correct name in Death Recap. Tooltips should now display correct damage reduction per level. Fix to Lt. Belica being locked out of movement if the target dies while using Neural Disruptor. Belica's targeting reticle should no longer disappear after getting a kill with Neural Disruptor. Damage tooltip should now show the correct value. Old Saint Riktor skin should no longer have any lighting issues in the shadows. Now grants the correct amount of damage when hitting soul stack tiers. Updated slow duration on the tooltip. Should now deal correct damage to minions. Removed reputation as a potential reward from weekly quests. Now you can earn more weekly card packs.